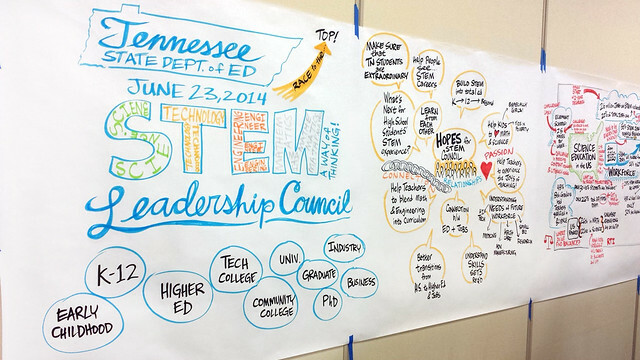 On Monday, we took a short trip down the block to scribe for the Tennessee Department of Education's STEM Council Meeting. The TN STEM Council was brought together to discuss the future of STEM education — that's Science, Technology, Engineering, and Mathematics — in the Volunteer State, and to take stock of how Tennessee is doing compared to the other states of the Union. It is the mission of the STEM Council to change the way we approach STEM education in Tennessee, making sure students are not only passing their STEM classes, but are mastering the subject matter and are confident to move through the stages of education and into a job market that is increasingly dependent upon science and technology. The TN Department of Education brought together an intelligent and energetic group of educators, industry leaders, and administrators to assess where TN stands on STEM education, to determine what needs to be done to move us forward and improve our programs, and to shape our STEM curriculum to fit the needs of Tennessee's rapidly growing tech industry. Alphachimp’s pens were flying as the Council examined changes in outlook, curricula, programs, and policies. Peter Durand synthesized the group's ideas as they spoke, and created a map of colorful and engaging images to chart the course of their discussions. Peter was able to capture the main points in a visual framework for the Council to refer back to and use to educate other STEM organizations. The overall consensus of the Council? We are doing better every year. Last autumn, Gov. Bill Haslam announced that Tennessee had the largest academic growth on the 2013 National Assessment of Educational Progress (NAEP) of any state, making Tennessee the fastest improving state in the nation. Yet there is still plenty of room for growth. For example, a study from 2013 showed that only 42% of 4th graders and 35% of 8th graders were proficient in math. Another study from 2013 reported that 30% of seniors who took the ACT were ready for college-level work in science. Only 31% of Bachelor's degrees in the US were in the fields of science and engineering in 2008, as opposed to 61% of Japan's and 51% of China's degrees. These statistics are even more frightening when we realize that about 20% of US jobs are STEM-related, and the number of Tennesseans in STEM occupations is expected to grow by 11.5% over the next ten years. To learn more about the evolution (and challenge) of improving Tennessee’s national ranking in education, check out the TEDx talk by our Commissioner of Education, Kevin Huffman. To learn more about STEM education, visit the TN-DOE website. Wednesday brought another STEM-related event for Alphachimp with a meeting of the Vanderbilt University Biomedical Engineering (BME) faculty. The BME department of VU, a rising star of biomedical engineering education in the US, came together to think deeply about the needs of their students, their faculty, and the industry they will be sending their students into. Alphachimp acted as facilitator for the group, guiding their ideation and helping them create a visual strategy to achieve the goals they set for their department. ABOVE: The core faculty of Vanderbilt University's Biomedical Engineering department. Our very own Marathon Village was the setting for this event, complete with giant windows for drawing out ideas, and antique cars to fascinate the engineering faculty. Graphic Facilitation is gaining amazing momentum as a tool used for council meetings, brainstorming sessions, and any other event where a group of individuals is tasked with thinking together and fully engaging with a topic. If you have an event that would benefit from this type of innovative and interactive guidance, let us know here. Want learn how to scribe and facilitate your own events? We offer an online, work-at-your-own-pace course called Become a Rockstar Scribe. Our next course goes LIVE on August 11th!